What accounts for how we have fallen away from the view of time held by our ancestors – for why we live in a fundamentally different world? After all, it might be argued that deep down we are the same people, and deep within us we carry the potential to see the world exactly as our ancestors did. This is true – and elsewhere I have argued that the worldview of a people flows from its nature, which is heritable. And yet, while that potential remains dormant within us (and can be reawakened), the fact is that right now it is merely potential: we do live in a very different world from our ancestors, and think in fundamentally different ways. In large measure, it is Christianity that is responsible for the shift away from the traditional Germanic view of time. Specifically, as I shall discuss in more detail later, Christianity replaces the Germanic “primacy of the past” with a focus upon futurity. Before developing that point, however, I must sketch in some more details of Bauschatz’s account. “to become.” However, this word is ultimately derived from an Indo-European root meaning “to turn.” Thus, what is becoming is somehow what is “turning.” We can get the sense of this when we realize that becoming can often be seen as “turning into”: the child turns into a man, the caterpillar into a butterfly, the apprentice into a master, and so on. The past is thus continually growing, as our deeds fill it. And, indeed, it is pictured as a container: as the well of Urðr, the first of the three Norns, the one who represents the past. Urðr governs the “working out” of the past into the present: how past forms or deeds shape the present. The past functions to shape all that “turns” or “turns into” in the present. And pastness – past events, actions, precedents – serve as, in effect, “laws” that govern what may become. One sees the application of this metaphysics in, among other things, the Anglo-Saxon tradition of “common law” or judicial precedent. 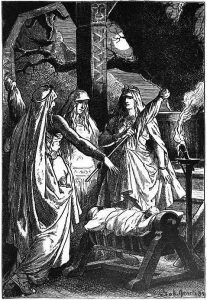 The Old English equivalent of Urðr is Wyrd, sometimes treated as a kind of force or primal mechanism that affects events. Urðr is, it would appear, both the “keeper” of the past, as well as “fate” or “destiny.” This makes perfect sense, as it is precisely the past that fates, shapes, and destines the present. In this context, the sources also make mention of the ørlǫg. While I would translate this literally as “primal law” (with Old Norse ør- roughly equivalent to German, Danish, and Norwegian ur-, “proto-, primitive, original”), it is sometimes glossed, rather confusingly, as “fate” or “destiny,” just like Urðr/Wyrd. But we may simply see ørlǫg as another way of speaking of the function of the accumulated past as “primal law” governing the unfolding or turning of the present. As in much of mythology, certain concepts have blended together – and we will see this again in the case of hamingja and fylgja. Indeed, Bauschatz argues that the three wells of Norse myth are actually one well, the primary identity of which is the well of Urðr. (He invokes the well-known mythological phenomenon of multiplication of one thing into threes, many examples of which are to be found in Norse mythology: e.g., the brothers Oðinn, Vili, and Vé, who Edred Thorsson has argued are three aspects of one god. ) Bauschatz’s hypothesis about the identity of the wells makes conceptual sense: the well of the past (Urðr’s well) is most certainly a well of wisdom. This is true even though the “well of wisdom” is usually identified as the separate well of Mímir, from which Oðinn drinks at the price of an eye. The identification of the two wells makes even more sense if Mímir has something to do with memory (as is theorized by Rudolf Simek and others ). Bauschatz also emphasizes that the past must be understood as nutritive. After all, it is with the water of the Well of Urðr that the Norns nourish Yggdrasil. The spring/well flows into the present, nourishing the present: nourishing Yggdrasil and informing our lives and deeds; shaping what we are. Meanwhile, our deeds flow into the spring/well. It is continually being fed by the present, as the present recedes into the past. The cycle is simply this: the present nourishes/expands the past, and the past nourishes/expands the present. It is obvious that this worldview is actually quite foreign to our own. We think of the past as over and done with. Our orientation is toward a present that we think has “overcome” the past, and toward a conceivably “better” future that we are trying to reach by slogging through the (usually dissatisfying) present. The idea of “overcoming” the past is a key component in the Judeo-Christian tradition, and in the modern, progressivist worldview: both see the past as darkness steadily being overcome by the light. By contrast, the Germanic worldview holds that in a meaningful sense the past is not “over with”: in actuality, it is continually present, shaping what comes to be. The more we moderns live in denial of the shaping power of the past, the more we are at its mercy, as I shall discuss later. (a) It is a shape-changing force, which acts on the hamr (literally “skin”): to create a form (form in the sense of Greek morphē, a shape, as in “morphology” and “metamorphosis”). Claude Lecouteux writes of the hamr: “In the old texts, it is the inner shape that determines outside appearance. It so happens that a person could have several of these shapes. . . . Expressed here is the fundamental idea that man is not restricted to his body.”  Simek theorizes that hamingja is derived from *ham-gengja, those who could let their hamr “walk” (i.e., project their hamr). (b) The “luck” or “fortune” of the individual. The fylgja is also conceived as a guardian spirit. The word itself is formed from the Old Norse verb fylgja, meaning “to follow” or “to accompany” (from Proto-Germanic *fulgijaną, “to follow,” from which comes Old English folġian, which gives us modern English “follow”). Thus, the fylgja is a being that follows or accompanies. In the lore, it often takes the form of a woman – indeed, sometimes a gigantic woman clad in armor (the fulgjukona; thus suggesting to Hilda Ellis Davidson that there is a link here to the concept of the valkyrja ). At other times, the fylgja takes the form of an animal, usually one representing the type of person one is (a noble man, for example, will have a noble animal fylgja such as a bear, wolf, or eagle). This example seems to suggest, interestingly, that the animal form of the fylgja may “grow” with the individual: little boy, little bear cub; presumably full-grown man, full-grown bear. And if this is the case, then the suggestion is that the fylgja is just the individual. In other words, the fylgja is the individual appearing under another aspect – and not a distinct “thing” that the individual “has.”  This may seem puzzling, but as I noted earlier in this essay, both a philosophical understanding of personal identity, and one drawn from the Germanic lore, challenge us to rethink our idea of who and what we are. Again, I am not simply this “thing,” inside this skin, endowed exclusively with traits perceptible to the five senses. Indeed, as we saw in discussing the concept of the hamr, a man can have several “skins.” But if the individual is not distinct from his fylgja, then how can the fylgja be passed on? Why doesn’t the fylgja die with the individual? To explore these mysteries, let’s turn once again to Aristotle, who can give us invaluable assistance. When we see the fylgja, what we are seeing is the essence of the individual – where “essence” is the Latinate translation of Aristotle’s to ti ēn einai, literally “the what it is to be.” This essence is what the individual is (thus, Þorsteinn’s essence is a bear). Further, we are compelled to say that the individual and his essence are not distinct, since if they were, that would mean that the individual is not what he is. This is entirely correct – and yet in another, equally meaningful sense we can say that the individual and his essence are distinct. To see this, set aside, for just one moment, how one’s essence can be a bear and consider a simpler, and very Aristotelian example: the essence of Socrates is to be a rational animal. Since this expresses what Socrates is, Socrates and his essence are one. Yet, it is also the essence of Plato to be a rational animal – and also the essence of Xenophon, Alcibiades, Critias, and all other human beings. So, Socrates both is and is not identical with his essence. Exactly the same may be said of Þorsteinn and the fylgja that expresses his essence: it is him, yet it is not, for it may also be or become the fylgja of his son, or some other descendent. This is yet another example of the influence of the past on the present. Thus, it is not unreasonable to think that certain individuals have an “animal nature” archetypally like that of a specific animal. This nature is the “essence” of the individual. Again, it is both one with him and not one: capable of being “passed.” It exists all the time “with” the individual, “following” him. It is not perceptible in “this world,” because it belongs to another. But since, as Lecouteux observes, there is “really no border” between that world and this, then there is no gulf between the individual and his fylgja. This “essence” is not a separate “thing” (though, as we have seen, it can be perceived under certain circumstances as if it were a distinct thing). Rather, it is the individual seen under another aspect. My being is formed (pre-formed, really) in relation to “the Animal” and to “the Woman.” This may seem to imply some kind of relation to Platonic ideas, but what the Germanic lore actually suggests is this: Just as the individual is truly individual and not an abstract idea of “individuality,” so his “Animal” and his “Woman” are individual; they are archetypal, but not “abstract.” Archetypes are not abstractions: Achilles is an individual, not the abstraction “the Hero.”  But the lore also suggests, quite mysteriously (and quite unlike Jung’s views) that these archetypes exist in a parallel world, and that they are not “virtual images” of some kind, but rather “beings” endowed with agency. Edred Thorsson has also drawn on Jung in discussing the fylgja, specifically Jung’s theory of the “anima/animus.”  These are reasonable speculations. However, I should admit that I know of no evidence in the Germanic sources which suggests that women have a male fylgja. It is interesting to note, however, that in the sources it is often later generations of a family that exhibit real greatness. The best-known example of this is in the Volsunga Saga: it is Sigurðr who represents the perfection or consummation of the Volsung clan. This also makes sense: if one can acquire multiple fylgjur, which strengthens the kynfylgja, and if the hamingja is fed by heroic deeds, then clearly something builds or grows across several generations. For a discussion of the concept of “world,” see my essay “The Ninefold ” in What is a Rune? and Other Essays , ed. Greg Johnson (San Francisco: Counter-Currents Publishing, 2015). See my essay “Ásatrú and the Political ” in What is a Rune? A Presocratics Reader, Second Edition, ed. Patricia Curd (Indianapolis: Hackett Publishing, 2011), p. 17. Paul Bauschatz, The Well and the Tree (Amherst, Ma. : University of Massachusetts Press, 1982), pp. 15-16. See Edred Thorsson, Runelore (York Beach, Maine: Samuel Weiser, 1987), p. 179. Rudolf Simek, Dictionary of Northern Mythology, trans. Angela Hall (Rochester, Ny: D. S. Brewer, 2000), p. 216. Also Thorsson, ibid., p. 180. See Stephen E. Flowers, Sigurðr: Rebirth and the Rites of Transformation (Smithfield, Tx. : Rûna-Raven, 2011), p. 47. On this, see Flowers, ibid., p. 52; also see H. R. Ellis Davidson, The Road To Hel (Cambridge: Cambridge University Press, 2013), p. 130. Claude Lecouteux, The Return of the Dead, trans. Jon E. Graham (Rochester, Vt.: Inner Traditions, 2009), p. 169. See Davidson, ibid., p. 130. See Flowers, ibid., p. 52. See Flowers, ibid., pp. 94ff. Flowers’ book is a reprint of his M.A. thesis. See also Lecouteux, who quotes the author of the Poem of Helgi: “Once upon a time it was thought that men were reborn. . . . It was said that Helgi and Sigrun lived again” (Lecouteux, ibid., p. 163). Flowers writes that “the fylgja as well as the hamingja must not be thought of as forms, but rather as aspects of the ‘spiritual’ essence itself, which was originally equated with the procreative power and potency of a man” (Flowers, ibid., p. 53). For the general argument sketched here, see Aristotle’s Metaphysics, Book Zeta. Rupert Sheldrake, The Presence of the Past (Rochester, Vt.: Park Street Press, 1988), pp. 15-16. The essay appears in What is a Rune? Quoted in Sheldrake, ibid., p. 251. Italics added. For more information on this point, see my discussion of Vico’s distinction between imaginative and intelligible universals in “What is a Rune?” in the volume of the same name. See Flowers, ibid., p. 55. See also Lecouteux, ibid., p. 166. See for example the Volsunga Saga Chapter 4, in which Signy is warned against marrying Siggeir by her kynfylgja. See Flowers, ibid., p. 53; Davidson, ibid., p. 131. Lecouteux, ibid., p. 162. Lecouteux also notes (p. 163) that a child who is not given the name of a dead relative can be vulnerable to an illness known as elsk. See also Davidson, ibid., p. 132. Although the hamingja–fylgja passes within a clan, it appears it may pass between individuals who are not actual blood relations. Davidson (p. 132) cites an example of a hamingja passing from a man to his son-in-law.